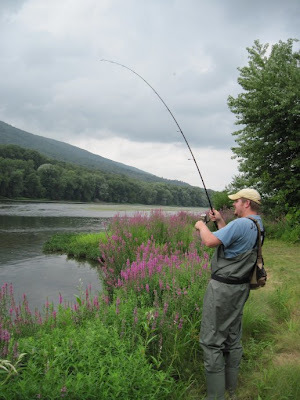 Toby Jones Fishing: Pre- and Post- Irene... Man, she was MEAN! Pre- and Post- Irene... Man, she was MEAN! Since my last entry we have experienced some excitement here in PA, and all along the East Coast of the US for that matter. Last week Hurricane Irene came to visit us... And unfortunately she turned out to be a very UN-welcomed guest for many. Hurricane force winds, torrential downpours, battering waves, and a massive storm surge caused billions of dollars worth of damage across the East Coast of the US...and left many without electricity for days. lucky that our power remained uninterrupted. Looking at the USGS Stream Flow Data, basically all the waterways from the Susquehanna on east are currently running high and muddy. Still, the nearby Juniata River is one of our local flows that was spared any significant amount of runoff from the storm... In fact, it never really rose more than about 6" according to the Newport gauge. So, lucky for us, we were actually able to do some fishing this past week. We hit the river twice this past week--once right before the storm, and then again a couple days later. 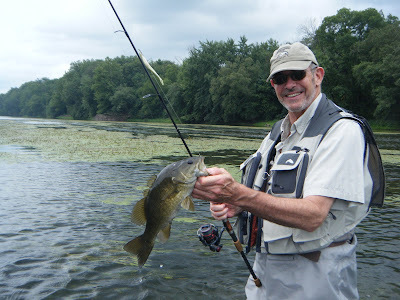 My Dad and I had high hopes that our local smallmouth would be putting on a major feed right before Irene arrived at our doorstep. In the end, we did catch a few fish each, but the bite never did turn out to be what we were hoping. Our second trip to the river didn't turn out much better either... In fact the fishing was a little bit slower than normal, as it seemed the fish were lying low and had not yet recuperated from the storm. Still, we did manage a few fish--with my nephew Bailey catching the nicest.